Needless to say, a good PowerPoint is key to show your ideas in front of audiences. Just watch on TED and you cannot agree more. The point is how to make a great presentation, by using sharp words, title, figure, or your deep insight on a certain subject. All these are absolutely necessary and to tell you the truth, the way and the form to make your PowerPoint is also a highlight to make a good PowerPoint. As far as I am concerned, a good PowerPoint consists of many aspects, which can be easily shared and mastered if you spare some efforts on learning from the wisdom of great PowerPoint slides. Universal rules apply to all good PowerPoint presentations examples. Do not be too greedy to present a variety of ideas in one PPT. This is unreasonable and will destroy the theme topic as a consequence. Present one topic at a time. Being ambitious is good but being logical and reasonable is much better. - Streamline your topic logically. This is unreasonable and will destroy the theme topic as a consequence. Present one topic at a time. Being ambitious is good but being logical and reasonable is much better. - Pay attention to the overall layout of the slides. Text size, font, image, or color of the words are all important to a good PowerPoint. Do not make the PowerPoint look messy. You can take advantage of free commercial templates to make your slides consistent. - Apply pictures, figures, or music to improve the overall performance of a PowerPoint. An image is worth a thousand words. Remember this. - Add a logo to the slides for better protecting the file. You can attach a unique logo to declare your copyright and avoid others from copying or editing your file randomly. These are the major tips for making a good PowerPoint presentation. You won’t miss anything if you follow these rules when you make a PowerPoint. And talking about the free commercial templates, I am happy to source some useful links here for your reference. 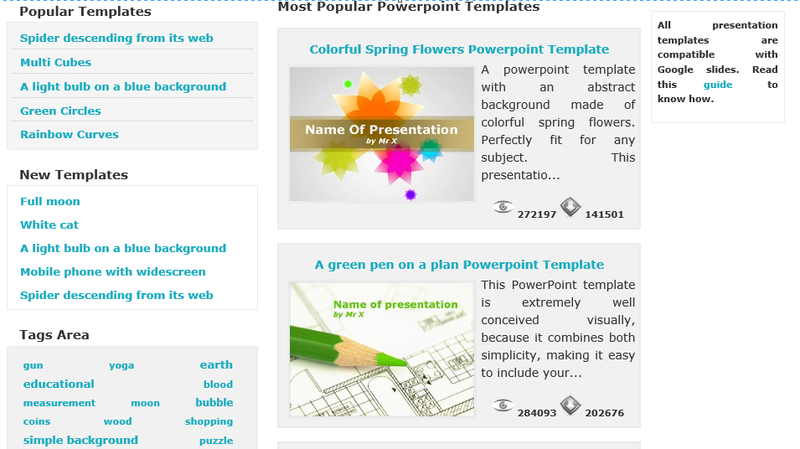 Microsoft has provided plenty choices of free templates for users to fulfill a great PowerPoint presentation. They have categorized themes and topics, where users are free to find what they want by locating the theme to search for a target template. You can view details through here. There are also other choices to get free PPT templates. For example, PowerPoint styles is a good source with abundant templates ready for making a great PowerPoint. You will not need to worry about the layout or how to arrange your texts with other contents. All have been prepared well and you only need to fill in contents. A good PowerPoint presentation is handy to make, isn’t it? I see many people have also asked how to make a good PowerPoint presentation with some background music, logo, or even burn them to DVD for better enjoying on TV or video player. You’ve been lucky as Leawo PowerPoint to DVD Pro is exactly such a program for users to customize PPT slides and burn them to DVD. This professional program is developed to convert PowerPoint to video and burn PPT to DVD/Blu-ray with customized menu. Note that this program also has a tank of templates free for users to try. Let’s get it started to see how to create a PowerPoint presentation step by step using Leawo PowerPoint to DVD Pro. Step 1: Get the program ready. Click the below button to install and get the program ready for converting files. Step 2: Get files imported to the program. Click Import on the tool bar to add source files to the program. Click Options on the tool bar to set mode, aspect ratio, output folder etc in details. Step 4: Choose a suitable template to modify the PowerPoint slides. From the Menu tab, you can choose one suitable template. Step 5: Add background music to the PPT slides. On the Music tab, add background music and specify the auto mode or manual mode on the right pane. Step 6: Input a logo to the slides. A good PowerPoint presentation is always protected with a unique logo. Click Logo to add one with your own characteristic. It is a great tool to protect your copyright and make good use of it. Click Burn and you will see the below page, where you can pick Burn to Disc and click Start to kick off the process. Once it is done, a fresh DVD will be made. Enjoy it on your TV or video player with your friends, colleagues, or students. Speakers, teachers, business men, or people from other areas are all eager to know how to make presentation slides more interesting in order to better present their ideas, share their work, or teach their students. The above tips and free templates are of great help to make a good PowerPoint presentation in an efficient way. Furthermore, Leawo PowerPoint to DVD Pro is a good choice to burn PPT to DVD and it allows users to add a lot of modifications to the PPT slides. In other words, this program takes a big step closer to the perfection of a PowerPoint presentation. Try it out and feedback to us.